Even at the height of summer, when the upper crust of Cairo descends on the nearby Mediterranean coast, the world’s largest open-air armory is a bleak place. With up to 17 million land mines buried in the sands of northwest Egypt, no one can set foot beyond the carefully demarcated boundaries for fear of losing a limb—or their life. Home to what’s likely the world’s largest unexploded minefield, the area is an eerie reminder of the ferocity of World War II. It saw serious action in the early 1940s as the British sought to stymie the advance of Nazi Army General Erwin Rommel’s vaunted Afrika Korps, and the German, British and Italian armies buried millions of tons of explosives as they battled one another across North Africa. 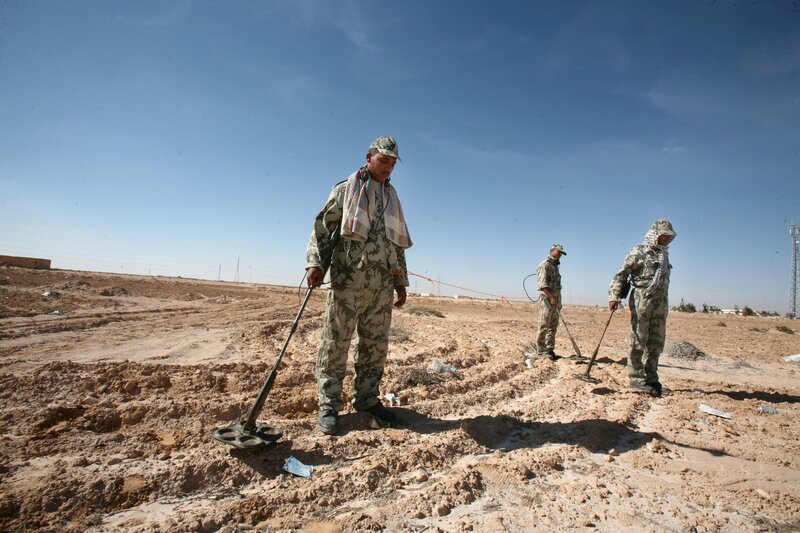 But until recently, the minefields of the Sahara posed a problem mainly for local Bedouins, who are among the few who live in the area; since 2006, they’ve suffered more than 150 casualties. The phenomenon, he says, began in 2004, when extremists killed 34 people in the Sinai resort of Taba with seven bombs crafted from old munitions, and has become relatively common practice as security has devolved in parts of Egypt, especially since Ansar Beit al-Maqdis, the country’s most prolific homegrown jihadi group, pledged allegiance to ISIS in late 2014. Given the large number of modern munitions available in the region, it might seem unusual that some extremist groups and criminal gangs have taken an interest in the debris of a distant conflict. From Saudi Arabia, the world’s second largest arms importer, to Libya, whose tiny army once boasted at least as many guns as the British military, the Middle East and North Africa are awash with advanced weaponry. But for groups like ISIS’s fledgling affiliate that operates in Egypt’s vast arid interior, as well as in neighboring Libya, where ISIS also has a foothold, a bomb is a bomb. With periodic supply problems and an exceptional quantity of large anti-tank mines rich in explosives seemingly readily available, the temptation to pilfer the relics of Hitler’s war has proved too tantalizing to resist. Most recently, in March, a jihadi IED attack on an army convoy near Egypt’s Red Sea coast that killed five soldiers was blamed on explosives purloined from old mines. Military officials, who recently received a delivery of more than 700 mine-resistant vehicles from the U.S. to help them combat an insurgency in North Sinai, are trying to ward off the threat, with mixed results. Digging up these mines is a task fraught with danger. Shifting sands and fierce winds periodically trigger the aging devices. But residents of villages around Marsa Matruh, 130 miles east of the Libyan border, are poor—the thick cordon of explosives that surrounds the area for 2.5 miles in three directions has hurt development—so for some desert-dwelling tribesmen, who struggle in the sparsely populated expanses far from the centers of power in the Nile Valley and Delta, the risk of uncovering these mines to sell the scrap metal and explosive material is worth the reward. “They do this because they have nothing else to live on,” says Abdul Moneim Waer, who lost three fingers to a mine when he was young and now campaigns for land mine awareness in El Alamein. Egypt is not the only country in the region where World War II armaments have found their way back onto the market. Weapons investigators in Iraq recently documented a 1942 Lee-Enfield rifle that Kurdish peshmerga captured from ISIS in the northern town of Tuz Khurmatu. In Mali, authorities have dug up an array of deadly arms, including a stockpile of more than 10,000 old European guns. Video footage from Syria suggests that a rebel group has at least one operational howitzer dating from the 1940s. And then there’s lawless Libya, the munitions bazaar of Saharan Africa, where arms researchers have found an ample supply of Allied and Axis weaponry. “We’ve seen several dozen British Webley revolvers previously or presently for sale, and then some Italian cavalry carbines, some Mausers, Bren guns,” says N.R. Jenzen-Jones of Armament Research Services, an independent arms consultancy, who is currently working on a report about the role of “legacy” arms in modern conflict zones. But what makes Egypt’s minefields so problematic—aside from the large volume of bomb-making matter—is that they protect smugglers and jihadis penetrating inland from the uncontrollable Libyan border. By hiring local guides with good desert know-how, some of these SUV convoys—which tote everything from guns to fake brand-name cigarettes—carefully pick their way through stretches of the country ridden with land mines. Because they have no fear of stumbling on army patrols, who won’t stray into contaminated areas, “it’s become a refuge for them,” Shazly says. In an effort to counter the security hazards posed by the mines, as well as to free up sizable oil reserves reputed to lie beneath the afflicted area, Egyptian authorities say they’ve accelerated clearance efforts. Three million mines have been removed since 1981, making available over 600,000 acres, according to the army. The government insists the rest will be disposed of within the next three years. But for a desert whose inhabitants are reeling from increased terrorism, none of this can come soon enough. They’ve seen American and Croatian oil workers kidnapped and killed over the past two years—at a time when jihadis launched several large and deadly attacks on the Egyptian military. The government’s efforts to regain total control of the region have sometimes compounded the problem. Eight Mexican tourists were killed last year when an Egyptian Apache helicopter mistook them for jihadis and opened fire with rockets and a machine gun. A few months earlier, a gas exploration crew from a French company only narrowly avoided a similar fate, an American oil worker tells Newsweek on the condition of anonymity, as he wasn’t authorized to speak to the press. Since then, energy companies have worked out a system whereby they fly colored flags from their jeeps when traveling in restricted areas, calling in the color to their liaison officer every morning. For most Bedouin, however, their real ire is reserved for those who planted these killing devices. “They’re getting away from their responsibility,” says Ahmed Amer, head of the Land Mine Survivors Association in Marsa Matruh, which lobbies for victims’ rights, referring to the European powers that were responsible for laying most of the munitions. “They can’t just come here and then go away,” he adds. “They must clean this up.